After you came out of the Luxembourg you could walk down the narrow rue Fèrou to the Place St.-Sulpice and there were still no restaurants, only the quiet square with its benches and trees. There was a fountain with lions, and pigeons walked on the pavement and perched on the statues of the bishops. There was the church and there were shops selling religious objects and vestments on the north side of the square. From this square you could not go further toward the river without passing shops selling fruits, vegetables, wines, or bakery and pastry shops. But by choosing your way carefully you could work to your right around the grey and white stone church and reach the rue de l'Odèon and turn up to your right toward Sylvia Beach's bookshop and on your way you did not pass too many places where things to eat were sold. Participating in the Paris in July challenge by fellow bloggers Thyme for Tea and BookBath has been such a fabulous journey through all things Parisian. I chose this week to read, while preparing for my vacation at the Hemingway Days festival in Key West by reading Ernest Hemingway's, A Moveable Feast. Set in 1920s Paris, it is a retrospective by Hemingway of his life at that time, married to Hadley and surrounded by fellow ex-pats that ranged from Gertrude Stein to Ezra Pound and to F. Scott Fitzgerald. Almost every page provides an image into life in Paris, and I found myself wandering the rue Cardinal Lemoine or by the Seine, drinking from a small carafe of wine or eating in one of the cafès that Hemingway gathers to write. Perhaps he is at the next table? Although Ernest Hemingway writes in his preface, "If the reader prefers, this book may be regarded as fiction. But there is always the chance that such a book of fiction may throw some light on what has been written as fact." This he relates after he has completed writing A Moveable Feast in 1960, and it is honestly told, no fluff to his descriptions of streets, stores, and life for him and his wife. It is before Hemingway has become the famous writer, and in Paris, he is a struggling writer, being turned down by American magazines, and only being accepted by German publications. Each page is his daily life writing and struggling, living and struggling, and providing for his family. He writes of Hadley in a favorable light, almost sweetly, and she is his supportive wife, and I felt regret from Hemingway. I thought of him writing these events, now an older man living in Cuba, about his younger life in Paris, loyal or insane or sad ex-pats rounding out his circle of friends, and he is unashamedly blunt in his thoughts on each writer or poet that he interacts with. Hemingway is honest in every detail that he shares. If it is a dark day with black clouds, that is how he writes it, with nothing more, nothing less. 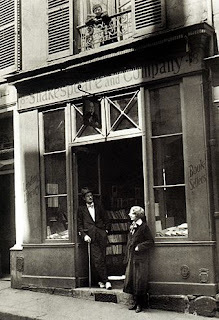 I was enchanted by that and I was left to my own imagination, as Hemingway would walk the streets to Sylvia Beach's bookshop, Shakespeare and Company. He writes of being provided books to read on credit, and how he and Hadley save to go on trips together, and how much love they had for each other. Together, they played the races, but it never created tensions between them, only people did, he writes. I found it all to be incredibly sad, especially in the final pages as he writes about deception and his first affair, and it drips with sadness, regret for his choices, and my heart broke again. Perhaps I was so sad about these events because Hemingway, shortly after finishing this book, commits suicide. Does he wish for life to be done over again, to make better choices? Perhaps I am such a fan for Hemingway and his life that this book touched me so deeply. Or perhaps it is the stark grittiness and beauty of Paris that he shares, and the grief of a writer in the midst of it all, that made me feel his lamentations and remorse? I can say that I read books with small Post-It notes to highlight pages that strike me as touching, funny, brilliant, grieving, and I can only honestly convey to you how I felt about this book by sharing this picture of it with you. I loved this story. what a beautiful review! I haven't read this Hemingway book but will definitely look for it next time I visit the used book store! Thanks, Stacy! 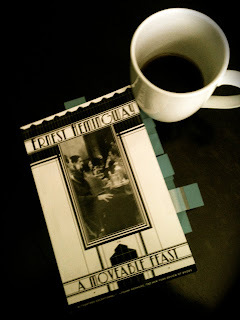 I ama Hemingway fan, but I must admit, A Moveable Feast really was a very moving work, and has turned into one of my favorites. It was so incredibly sad at the end, full of regret, and my heart broke with each word -- I do highly recommend, he is one of the greats! This book is one of my favorites, and underappreciated of Hemingway's works. I'm new to your blog, but I am really enjoying it so far. :) It's a new favorite. Thank you, Connie! I completely agree that it is not as valued as the rest of his body of work, which is so sad to me. I'll be going to Key West in less than 2 weeks and I'll be visiting his Hemingway home again, which I can't wait to see! And thank you for such a kind note, I am glad you posted on here, I'm excited to follow your blog as well! This is one of my favorite Hemingway books. I also read it on the way to and during Parisian visit, way back in the day. Lovely review, brings back warm memories for me--even though those February days met me with cold rain and a touch of the flu. Audrey, I highly recommend! Sometimes our parents' book shelves certainly offer up some fabulous stories that we never would have thought to read! I'd love to hear your thoughts after you read it! Thanks for visiting my blog, A Moveable Feast is what got me started with Hemingway too . . . If you check out some of the posts with the label "Hadley Tapes" you can find out more about those five years Hadley and Ernest spent together - definitely a bittersweet love story. I really enjoyed reading your review of the book and will check out the rest of your blog! A great review - thanks. I dont think I knew anything about this book before this. I think I would enjoy it as a visit to Paris of the past. I was lucky enough to go to Paris a million years (or so) ago, and somehow cleverly figured out this would be good to read on the plane ride over. Of course it was wonderful and when we got there, I especially wanted to go to the Cloiserie de Lilas, where he did so much of his writing. They had turned it into a huge Hemingway tourist trap, where even a coke was $8 (probably $20 in today's dollars!) and it was awful. Nevertheless, I felt like I was in sacred space! But anyway, in sum, I don't remember much else about the book except that it was so full of *atmosphere* and that I loved it a lot! Allie, so glad you could swing by and I love your blog! I can't wait to share after attending the Hemingway Days in Key West next week, too -- I love visiting his home as well! Tamara, it is a fabulous look into life in the 1920s and the authors and artists that he interacts with; I think you'll like it! Rhapsody in Books, how sad to hear about the Cloiserie de Lilas! :( But you are spot on about the book when it comes to the atmosphere -- the atmosphere that he sets as he meanders around Paris is wonderful! This Shakespeare & Co is apparently around the corner from the current bookshop, which Beach sold to George Whitman. He moved it out to the quai. Please do go there next visit, it is such a treat, and you might even see George, who I think is 98 now. BTW, he named his daughter, who runs the shop now, Sylvia. I've only read a couple of Hemingway's novels but not this one. I'm definitely getting this before my trip to Paris and I'll pass it on to my father who spent his student days there. We just now did A FAREWELL TO ARMS,and had a great discussion. Lots of different perspectives. I had a cake made with Papa's picture on it,and we had cake , and ice cream, after singing HAPPY BIRTHDAY to Ernest, then had homemade mojitos that I made using fresh mint I grow myself! most of them* Left out the word "of". sorry! Ruth -- I will definitely visit the bookshop, it would be an honor to meet George!! And how wonderful that he named his daughter Sylvia! Chasing Bawa -- I think you will really enjoy this one, please let me know your thoughts! Gary -- Thanks so much for stopping by and what kind words!! And to share this review with your book club -- how incredible for me!! Thank you!! I love how much you enjoy Hemingway and that you celebrated his birthday with cake! You may be interested in my upcoming posts as I just came back from Key West supporting my Dad in the annual Hemingway Days festival and the Contest held at Sloppy Joe's! It was too much fun! This is one of my absolute favorites, I'm so glad you loved it too! @ Avid Reader -- Yay, I'm so glad you liked it!! There is a great blog called The Hemingway Project (http://www.thehemingwayproject.com/) Check it out, the blogger has been researching Hadley and it is just fascinating! I loved reading your review because when I came away from this book I was speechless. Hemingway's writing and his honesty and the atmosphere he creates in A Moveable Feast left me in a haze of reflection for days. Such a cool book . . . wow. . . I had no idea.